Speechcraft affects disposition, i.e., how people react to you and how much they like you. Speechcraft can also be used to lower the disposition of some NPCs below their aggression rating as an alternative to a Frenzy spell (helps with Mercantile). A Novice can offer bribes to increase a person's disposition. An Apprentice can rotate the wheel once for free in the Persuasion minigame. A Journeyman's disposition falls 50% slower in the Persuasion minigame. An Expert's loss of disposition for 'Hate it' results is lowered from -150% to -100%. A Master's bribes cost half as much. You gain 2.4 experience points for each round of the persuasion minigame (i.e., after selecting all four possibilities) that causes the target's disposition to increase or decrease. You gain no experience points if the target's disposition at the end of the round is the same as in the beginning of the round. To increase speechcraft skill, practice the Persuasion minigame on everyone you meet. Use speechcraft to maximize the disposition of all NPCs; only use Charm spells after that point. Talk to an NPC with your weapon drawn, which will lower their disposition by 10. 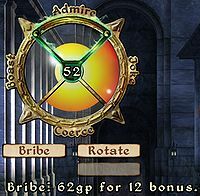 Choose any merchant with high Mercantile skill, and try to barter with the haggle slider set too high, so that they refuse the transaction. Every time you try to "rip them off" their disposition decreases by one point; repeat until their disposition is sufficiently low. When you raise your Personality attribute while leveling up, the maximum disposition of most NPCs also increases. Put the Gray Cowl of Nocturnal on just before talking to them. If you've already increased the NPC's disposition, they probably will still talk to you, but their disposition drops a significant number of points. Naturally, this tactic doesn't work with guards or fellow thieves. During the mini-game, do not be concerned with advancing your disposition towards the person you are speaking with. Instead, just keep clicking the smallest wedge repeatedly until you have trained up to the point that you wish to stop. Then, perform one or two final persuasions to get the actual disposition that you want. If this is a guard or generic NPC that you really couldn't care less about, leave them with a disposition of about 50 so that you can come back to them later in the game and use them again. Be cautious about lowering an NPC's disposition too low; an NPC may attack you when you stop talking to them if their disposition has been lowered below 20. An alternate method involves selecting wedges at random, as fast as you can manage (i.e. In the 360 version, simply spin the left stick in a circle and mash A as fast as you can.) This will usually raise the skill faster than taking the time to select, for example, the smallest wedge four times in a row. Trainers: Pay for speechcraft lessons. Skill Books: Books that provide lessons in speechcraft. Free Skill Boosts: Only one free speechcraft skill boost (for one point) is available, from the quest A Rat Problem. Magic Items: There are multiple generic items with the fortify speechcraft enchantment. Unique Items: A list of unique items, some of which fortify the speechcraft skill. These do not include Leveled Items such as those received from quests, or Artifacts. Boots of the Swift Merchant are a unique pair of boots that can be obtained from Seed-Neeus at the Northern Goods and Trade when your mercantile skill is over 50 (otherwise she does not sell armor). Amongst other enchantments the boots fortify your speechraft skill by 10 points. Black Hand Robe is a unique set consisting of a robe and a hood. Amongst other things the robe fortifies your speechcraft skill by 11 points, while the Black Hand Hood fortifies your speechcraft skill by 4 points. Councilor's Hood* is a unique hood that can be obtained from Skjorta at the Nord Winds. This item fortifies speechcraft by 10 points and also grants Resist Poison 25 points. Imperial Breeches are a pair of unique pants that can be obtained from Thoronir at the Copious Coinpurse. Amongst other things the pants fortify your speechcraft skill by 5 points. Vest of the Bard is a unique shirt that is obtainable Gunder at the Colovian Traders. Amongst other things the shirt fortifies your speechcraft skill by 5 points. * Note that this item is not readily available due to an error in the Construction Set. When your speechcraft skill reaches 70 or higher, NPCs will start saying: "You've got quite the silver tongue." The persuasion mini-game can be confusing at first but with a little practice and some basic tips you'll be maxing the NPC's disposition in no time. There are four different 'actions': Admire, Boast, Joke, and Coerce. During a mini-game you must select each action once. Every NPC will love one, hate one, like one, and dislike one. A given NPC's reaction to each of the four actions is predetermined, and will be the same every time you talk to that particular NPC. When you select an action that the NPC loves or likes, his disposition always goes up; when you select an action that the NPC hates or dislikes, his disposition always goes down. On top of that, the NPC's disposition will slowly go down with time as you play the minigame. Generally, it is fairly easy to tell which are the "loves" and "hates" actions for an NPC. Once you actually start playing the mini-game (i.e., once the colored wedges appear), hovering over each action will change the NPC's facial expression, with a big smile for the "loves" action, and a sneer/frown for the "hates" action. On Khajiit and Argonians, the facial expressions can be somewhat harder to recognize, but the height of the ears (up = happy) on a Khajiit and the width of the eyes (narrow = unhappy) on an Argonian should give sufficient clues. The other way to figure out that NPC's reactions is to "waste" a game by just clicking the full wedge four times in a row: notice whether the disposition goes up or down with each click. Since those reactions remain the same, you can then use that information to your advantage in subsequent games. Once you have identified the "loves" and "hates" reactions, the "likes" and "dislikes" reactions can easily be distinguished by switching back and forth between the two. Although they are subtle versions of their more extreme counterparts, you will be able to see a frown emerge when switching from "likes" to "dislikes", and the corners of the mouth rising slightly when switching from "dislikes" to "likes". With all four reactions identified, and their positions committed to memory, you can proceed to play the game. What you have to do is select each of the four actions in some order, based upon the size of the color wedges shown. When you choose the full wedge, you will get the maximum possible response from the NPC; when you choose the empty wedge, you get the minimum possible response. So to get the NPC's disposition to go up, you ideally would choose full wedges for "loves" and "likes" and empty wedges for "hates" and "dislikes". But the ideal is not always possible. When you start a mini-game, the computer randomly decides which wedges go where for that mini-game. Each time you make a choice, the wedges will rotate one position clockwise. If your speechcraft skill is high enough, you will also get one free rotation. Because time is working against you, it is generally better to act quickly than to spend a lot of time figuring out the perfect plan for each mini-game; the following strategies can help you make quick choices. Don't worry too much about making mistakes in an occasional game. You can keep playing over and over again (at least until the NPC reaches his maximum disposition). On your first mini-game with an NPC highlight all four wedges to see which ones are the "loved" and "hated" actions (ignore the other two for now). Choose the "hated" action when it has an empty wedge, and the "loved" action when it has a full wedge. For the other actions simply choose any sized wedge. Try to think one step ahead and anticipate where the wedges will rotate to in the next step. With this system you can always eventually get maxed disposition. Sometimes you may end up with a small loss on an individual attempt, but overall you'll make steady progress. Once you get the hang of things, you can add the "like" and "dislike" actions into the mix to maximize your disposition gain at each step. The Speechcraft perk that allows a free rotation helps a ton here. During the first mini-game, find out which are the two actions that they "hate" and "dislike" by moving your cursor over them. After that, select either of these two whenever the smallest wedge is in one of them. If the smallest wedge is in one of the sections they like then choose the other section they like which will have a larger wedge in it. This method is really fast and requires little thinking about which wedge to select. Concentrate on getting the empty wedge for the "dislikes" reaction at the expense of the "likes" reaction (for which any wedge will do). This strategy requires considerable skill and speed; however, if you're quick enough, it makes sure your score goes up each game. The following table provides the messages that are displayed when your Speechcraft skill levels up. Apprentice Persuasion, wheedling, cajoling, and coercing are all tools of speechcraft. They are tools you seek to excel in. You are now an Apprentice of Speechcraft. When persuading a character, you now get one chance to rotate the response wedges without having to select an action. Journeyman Persuasion, wheedling, cajoling, and coercing are all tools of speechcraft. They are tools you seek to excel in. You are now a Journeyman of Speechcraft. When trying to persuade a character, his or her disposition now decreases much slower. Expert Persuasion, wheedling, cajoling, and coercing are all tools of speechcraft. They are tools you seek to excel in. You are now an Expert of Speechcraft. When trying to persuade a character, you suffer less disposition penalty from the most disliked action. Master Persuasion, wheedling, cajoling, and coercing are all tools of speechcraft. They are tools you seek to excel in. You are now a Master of Speechcraft. 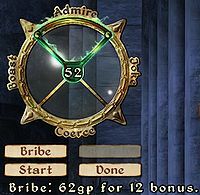 When trying to persuade a character, bribery costs half of what it would normally. Once your renown reaches 40, you can visit the Sithian heaven doomstone to receive the greater power Sithian Web. One of several benefits of this power is that it fortifies your speechcraft skill 20 points once a day for 120 seconds. If you can't raise the disposition of an NPC by enough try drawing your weapon. At first this will decrease the disposition of said NPC by 10, but you can raise it back again by 10. After this, sheath your weapon and the NPC's disposition will be 10 higher. A similar effect can be achieved by temporarily lowering your Personality score (e.g. by drinking cheap wine or using a custom Drain Attribute spell), raising the NPC disposition to the max with the minigame, and then getting an additional boost when your normal Personality score is restored. If you are in the Arcane university you can make a charm spell of 100 points for 1 second on touch. This spell will be cheap enough for a novice of illusion, and you should be able to talk to the NPC before the effect wears off (the animation of casting the spell doesn't need to be complete, as long as the NPC gets a greenish glow around him/herself). If you want more time to plan during a round of persuasion but don't want to lose any points of disposition, you can open the console on PC (tilde key by default) to pause the game without obstructing your view of the interface. Esta página foi modificada pela última vez à(s) 23h19min de 14 de dezembro de 2014.